ROSE TURTLE Ertler first started thinking about the power of compliments when she was praised for a performance done 20 years ago. Since then she has been thinking of ways to spread positivity. So, years later, she started a project that aimed to give people the open opportunity to spread kind words. Starting at the Village Winter Festival in Central Victoria in 2016, as an experiment, Rose began collecting auditory compliments in a caravan. Since then, The Complimentary Caravan has collected over 13,000 written, and 400 audio compliments. “The goal is to spread positivity and to remind people of the impact that words have on others.” Originally from Devonport, Rose has recently moved back to Tasmania where the Caravan has already made a positive impact. On the 1st & 2nd of March, Rose celebrated World Compliment Day outside Chudleigh Hall and at the Deloraine Market with her caravan full of compliments. People are invited to sit inside the caravan and absorb the kind words inside, then she encourages them to write a compliment of their own. “When you sit in the caravan and can hear and read the compliments, you know that they’re not for you but still absorb the positivity from it.” “I’ve done variations of this project without the caravan, such as Complimentary Lane; which was a soundtrack that played in an arcade as a part of a project that was looking for sound installations.” Rose chose a caravan for the body of her project because of its ability to become a peaceful and welcoming space. The Caravan is decorated inside and outside with yellow cards where people have written compliments. Inside, there is cushioned seating, where people can sit comfortably whilst absorbing the positive space around them. Rose hopes that everyone who has visited The Complimentary Caravan has been more able to share compliments in their day-to-day lives, to further spread positivity. She hopes that World Compliment Day will be celebrated more in the future. 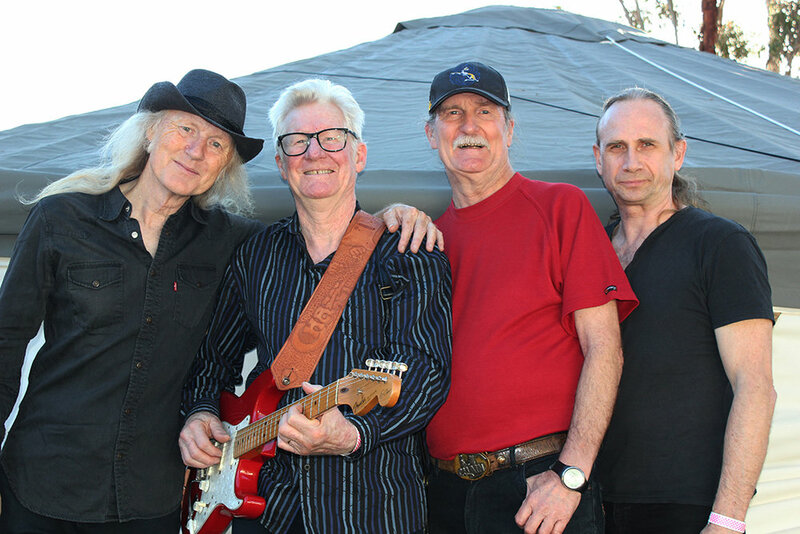 Legendary Australian rhythm and blues band Chain, celebrate 51 years as a band, appearing at the 22nd Forth Blues Festival in March. FOR SOME up and coming artists, the 22nd Forth Valley Blues Festival in March was their first big gig, while legendary Australian rhythm and blues outfit Chain celebrated their 51st year as a band. Kylie Rogerson, newly appointed President of the Forth Valley Blues Committee, will be taking the long-running music festival into the next century with strategies to increase future attendance, including a new online ticketing system, fresh upcoming artists and prominent headline bands. Outdoor music festivals are one of the few remaining platforms for young artists to perform live. Music venues, especially on the mainland, are under threat due to noise restrictions, pokie invasions and increased scrutiny on drugs. “Some festivals in NSW have been going for years and years and have never had any overdose trouble,” said Phil Manning, founding member of Chain. DELORAINE WILL showcase some of what it has to offer in front of the nation in May. A team from Channel Nine’s Postcards recently visited several locations in search of good food, wine and knick knacks. Postcards host, Rebecca Judd, has visited Tasmania several times before for work and weddings, but this time she got to experience the state in a different way. “Our first stop was Brush Rabbit, a gorgeous homewares store with beautiful art and knick knacks, then La Villa wines (a stunning Tuscan style villa showcasing delicious vino), then we stopped in at the Tasmanian Food and Wine Conservatory for the most incredible grazing platter I’ve ever seen,” she said. Piers Greville of Victoria with his painting, Pedder Prime Cuts, the winner of the 2019 Glover Prize. THE MUCH anticipated Glover Prize 2019 did not disappoint. The criteria for landscape referencing Tasmania saw 42 paintings chosen from 482 entries, attracting nationwide attention. 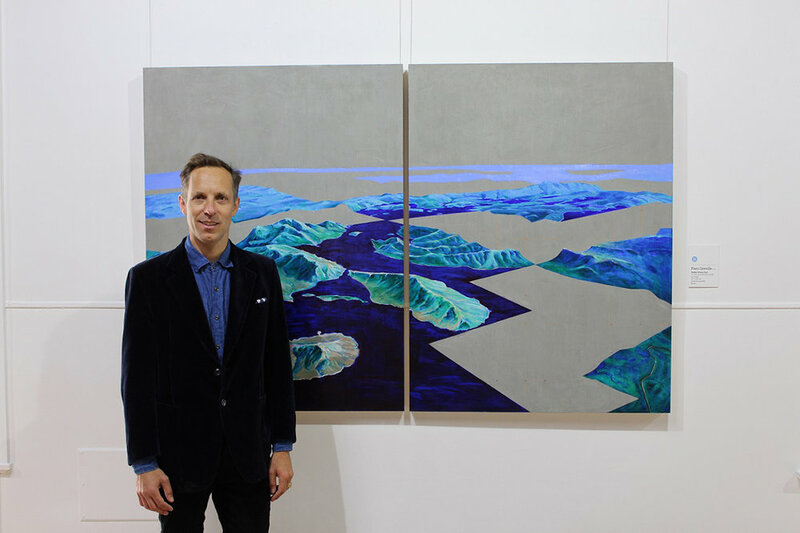 The diptych, Pedder Prime Cuts (Piers Greville, Vic) was the winner with a presentation in oils, acrylic and concrete representing mountains and hills on a flat grey board, Lake Pedder outlined in deep blue-black to reflect tannin coloured waters. And finally (and importantly) the Hanger’s Prize, Surfers are the Worst (Seabastion Toast NSW) – a smashing of colour and paint, fanciful waves crashing against Shipstern’s Bluff. Well deserved, as were all the awards. EIGHT BAD Dads from Launceston will bring their brand of soul rock’n roll to Deloraine’s Little Theatre on the 16th February. Presented by Arts Deloraine, the Bad Dads Orchestra’s guitar-driven sounds and soaring vocals are sure to have locals dancing the night away. According to Bad Dads member Luke Young, the band’s rule of thumb is: We bring the party to town! Together they’ve got hundreds of kids, hundreds of riffs and a big old bag of style and swagger. Support acts will be guitarist Eddie Tuleja and fresh-out –of-college punk rock band FEELS, led by Monique How. Luke said the Bad Dads Orchestra concept began more than three years ago as a social band, a sort of men’s shed for working musicians. And you had to be a dad. But not many people know that the band’s roots are firmly embedded in Deloraine. The co-founder with Luke was Liam Pennicott, who died a year ago; he grew up in Reedy Marsh where his parents Graham and Geraldine still live and the band continues his initiative after his death. “We actually started performing as a one-off for the Jackey’s Marsh Forest Festival but that was cancelled because of a bush-fire threat,” Luke said. The band first toured Australia’s east coast in 2018, including performing in Blues on Broad Beach on the Gold Coast and will tour there again in 2019. So will future members of the Bad Dads Orchestra definitely need to be dads? “Yeah we have a blanket rule but sometime we’ll need to open it up to others,” Luke said. So shine up those dancing boots. It’s big, it’s bad and it’s dad. PS, you don’t have to be a dad to see the Bad Dads Orchestra but dads are super-welcome! When: 7.00 pm, 16th February Where: Little Theatre, Deloraine Tickets: Adults $25.00; Arts Deloraine members $20.00 – available at The Alpaca Shop Deloraine & online at https:// trybooking.com/BADPD. The ‘Bad Dads’ will perform at Deloraine’s Little Theatre on 16th February. A BEAUTIFUL summer evening in Meander was the perfect place to enjoy the lively music of band Fru Skagerrak and soloist Liam Gerner. One of the many wonderful Small Halls concerts, featuring one Australian and one international artist, the Meander Memorial Hall was packed out with an audience of all ages. Sitting, hand-clapping, foot-stamping or dancing with children, the audience were all moved and delight ed by the traditional and not-so- music. Adelaide boy Liam, now Melbourne-based and travelling the world, displayed his original songwriting and strong performing talents with just enough of a country twang to counterbalance the intricate and quirky music of Fru Skagerrak. The latter, Anna Lindblad (Sweden), Elise Wessel Hildrum (Norway) and Maja Kjær Jacobsen (Denmark), play fiddles (violins), recorder and sing their way through lullabies, drinking songs and lively dances, a journey through the traditional music of Scandinavia with music and laughter a common language. With food and drink catered for by the Meander Hall Committee and Arts Deloraine, the concert embodied the Festival of Small Halls spirit - ‘bringing big music to small places’, celebrating wonderful music and the hospitality of small communities. Liam Gerner entertained the crowd with original songwriting. 2019 IS promising to be a great year for Meander Valley community radio station MVFM 96.9. With a new transmitter purchased and commissioned in 2018 and the aerial retuned to improve the signal, coverage now reaches more areas of the Valley and beyond. Thanks to grants from Bendigo Bank, Meander Valley Council and the Community Broadcasting Association of Australia, building renovations and equipment purchases have made the station more efficient. Listeners, memberships and sponsorships have all increased. Renovations for the second production studio space are complete. Equipment is being installed for live broadcasting to begin in 2019. 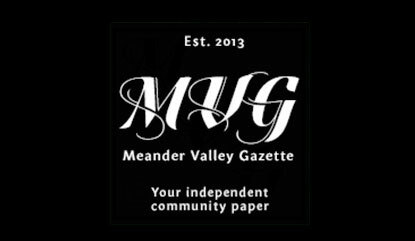 MVFM is run and maintained by volunteers, producing music and lifestyle programs, broadcasting a community calendar of local and council news, maintaining a Facebook page and website, servicing equipment and performing all the back-room tasks required to stay on air. The September AGM elected Mira Kuperstein (President), John Kenzey (Vice President), Tim Biggs (Treasurer) and Marijke McGough (Secretary), with committee members Nick Weare, John Phelps, Linda Irwin, Carol McLean Carr and Noelene Hanson. This year, for their work with the station, John Kenzey and Mira received Meander Valley Council Volunteer Awards. If you enjoy listening to MVFM, consider becoming a member or a sponsor. Membership is open to all Meander Valley residents for an annual cost of $30.00 ($20.00 concession). Membership and sponsorship allows MVFM to continue to broadcast, providing opportunities for people to make programs, meaningful training and work for benefit recipients and volunteers. In March, MVFM will begin a fortnightly ‘Member’s Draw’ where three members will receive a special prize from sponsors. Volunteers are always needed to make programs, to utilise their special skills in social media, website-building, technical and computer work, or to just help out around the station. Drop in to the studios located at 59-61 Emu Bay Road, between 10.00 and 2.00pm weekdays, to pick up a membership form, speak to one of the volunteers and have a look over the facilities. TWO OPPORTUNITIES to view the photographic work of well-known local naturalist Sarah Lloyd are available in Meander Valley during the month of February. Pixels Gallery will show a selection of Sarah’s ornithological pictures in an exhibition titled ‘Our feathered friends’ for the month of February. The digital gallery at 21 West Parade Deloraine (behind the Library) is open 10.00am to 4.00pm weekdays and 1.00 to 3.00pm Saturdays. ‘The Birds and the Bees’ is the title of a showing of selected bird and insect photos Sarah will have on show at Meander Valley Council offices from 12th February to 31st March. Young Australian classical musicians Anthony Albrecht and Simone Slattery will perform at Deloraine’s Little Theatre. TWO OF AUSTRALIA’S most adventurous young classical musicians perform a musical celebration of Australia’s birds and how they shaped the world at Deloraine’s Little Theatre on Saturday 19th January. In Where Song Began, Violinist Simone Slattery and cellist Anthony Albrecht tell the story of the evolution of song, featuring music spanning 300 years, stunning visual projections and an immersive soundscape. The show is based on ornithologist Tim Low’s best - selling book, Where Song Began: Australia’s Birds And How They Changed the World. Tim Low’s eye-opening book tells the dynamic but little-known story of how Australia provided the world with songbirds and parrots, among other bird groups, why Australian birds wield surprising ecological pow - er, how Australia became a major evolutionary centre and why scientific biases have hindered recognition of these discoveries. The renowned biologist with a rare storytelling gift says Australia’s birds, from violent, swooping magpies to tool-making cockatoos, are strikingly different from birds of other lands often more intelligent and aggressive, often larger and longer-lived. Simone Slattery was recently awarded a PhD in Music Performance from the University of Adelaide and performs regularly with Australia’s finest ensembles. Anthony Albrecht is an Australian graduate of The Juilliard School’s Historical Performance program and is now based in London. AWARD WINNING textile artist Cindy Watkins has always had an appreciation for the natural world, and after reading a book titled The Hidden Life of Trees by Peter Wohllenben, she felt inspired to combine her passion of artistic quilting with her love for trees. Residing by an ancient forest in Golden Valley, Cindy would go on nature walks, collecting gum leaves, tree bark, and other natural debris that she would use to dye silk that would later become a part of an awe-inspiring project that Cindy would later call ‘The 5000 Trees Project’. “The 5000 Trees Project gives me the opportunity to develop a style that is uniquely mine whilst helping our environment,” said Cindy. Cindy began by designing trees on paper, soon after she began to quilt her trees in a similar design. She used the naturally hand-dyed silk in most of her trees, experimenting with different colours and designs to create her unique and inspiring quilts. Cindy’s goal is to stitch the grand total of 5000 trees, donating $2.00 to Landcare Tasmania for every tree that she sells. Ultimately aiming to raise $10,000 to help protect and improve the natural environment. Cindy currently has her art displayed in the Wilderness Gallery at Cradle Mountain Hotel until the 28th February 2019. Her artwork can also be viewed at Brush Rabbit in Deloraine, and The Textile Artist in Launceston. So far, she has stitched 1000 trees. 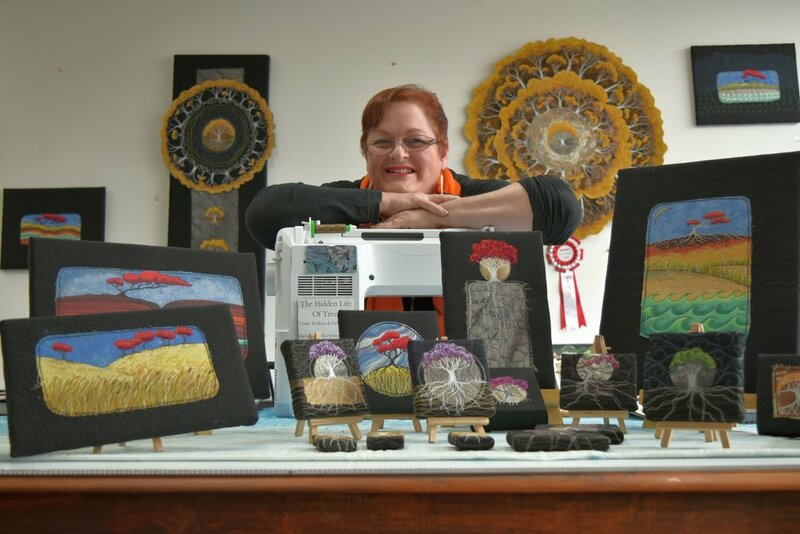 Golden Valley textile artist Cindy Watkins pictured with some of the works that make up her ‘5000 trees project’. Cindy will donate $2 from each tree sold. WEEKLY SQUARE Dancing classes will begin at the Deloraine Bowls Club on 18th January 2019. Square Dancing is a great way to exercise both mind and body to music and make new friends all while having a barrel load of fun. It will be a modern take on square dancing says experienced caller Gary Peterson. To find out more about the Square Dancing classes, please call 0499 088 680 for more information. MEANDER VALLEY resident Leanne Osmond ‘freezes’ out the competition - again! The Bureau of Meteorology has produced Australia’s best-selling weather calendar the ‘Australian Weather Calendar’, for over 30 years. It contains thirteen carefully selected photographs from all corners of Australia, each capturing an authentic and breathtaking weather experience, and it hangs on the walls of around 70,000 homes and offices across Australia and around the world. The Bureau of Meteorology received over 900 entries for their 2019 ‘Australian Weather Calendar’, and Meander Valley resident Leanne Osmond of Leeo Photography was chosen as one of the ‘lucky’ thirteen finalists. 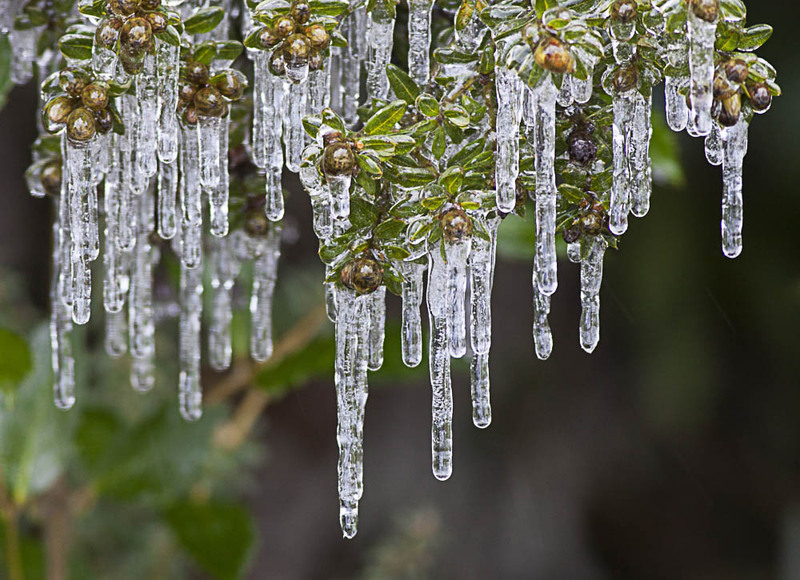 Her photograph Icicles at Liffey is the featured image for the month of December. This is not the first time she has made it into the calendar. Her image Frozen Spiderweb in St Marys was chosen for the 2017 calendar. Leanne moved to the Meander Valley in 2015 from South Australia and has been photographing the beautiful scenery of Tasmania ever since. She is an active member of the Mole Creek Photographic & Visual Arts Group, and was the inaugural artist to be exhibited at the Deloraine Online Centre’s Pixels Digital Gallery. Leanne’s latest exhibition at Pixels is entitled Tasmanian Treasures. Leanne’s image in the 2019 Australian Weather Calendar was taken in June 2016 on the Highland Lakes Road. View a selection of Leanne’s photos including Icicles at Liffey at Pixel’s in Deloraine during the month of December. All prints on show are available for purchase. Or for a larger selection head to http://www.redbubble.com/people/Leeo. ‘Icicles at Liffey’ by Leanne Osmond. COOL TEMPERATURES during the Tasmanian Craft Fair were a new experience for four visiting Cambodian artists and sculptors demonstrating their skills at the Deloraine event this year. Accustomed to the 30C-plus temperatures of their homes in Siem Reap in Cambodia’s north, the artists rugged up with scarves and jackets to combat cold November winds. Their manager, installation artist Svay Sareth, said the four were having an outstanding trip to Tasmania; stone sculptors Rath Phun and Chab Khchao had never been out of Cambodia before he said. “We are staying in a stone cottage in Dunorlan and loving it,” he said. “It was arranged for us by the Deloraine Rotarians; we have never stayed in such a place before. Svay, whose large installation art was not being exhibited at the fair but can be seen in Hong Kong, South Korea, Berlin and New York, spoke for the two stone sculptors who have workshops at Artisans D’Angkor in Siem Reap. There, tourists can see Rath and Chab and other craftspeople at work, using their ancient skills to make replica sculptures to rejuvenate the 9th – 15th century Angkor temple complex on a 162 hectare just outside Siem Reap – temples only uncovered from the jungles in recent decades and which are now Cambodia’s biggest tourist attraction. The fourth Cambodian, Nguon Savann Melea, is communications director at Artisans D’Angkor and showed fair-goers stunning silk scarves and handbags made from fabrics created at Cambodian silkworm farms and their attached weaving mills. Svay described bringing large slabs of stone to Tasmania, used by Rath and Chab to sculpt an elephant and an ancient Khmer king during the craft fair. But he also spoke to Rotarians in particular about the precarious political situation in Cambodia and the impact of China on the world economy. These subjects are embedded in Svay’s contemporary art, some of which has been collected by the National Gallery in Melbourne. Having grown up in a refugee camp in Cambodia during the 1970s and 1980s, a time of the notorious communist government of Pol Pot, the themes of war and resistance are always present in his work. DELORAINE WAS well represented in the People’s Library project. Three local writers were chosen out of the hundred statewide to have their work published as part of the project. A range of genres was represented from fiction to reference to poetry, all written, and donated, by Tasmanian writers. 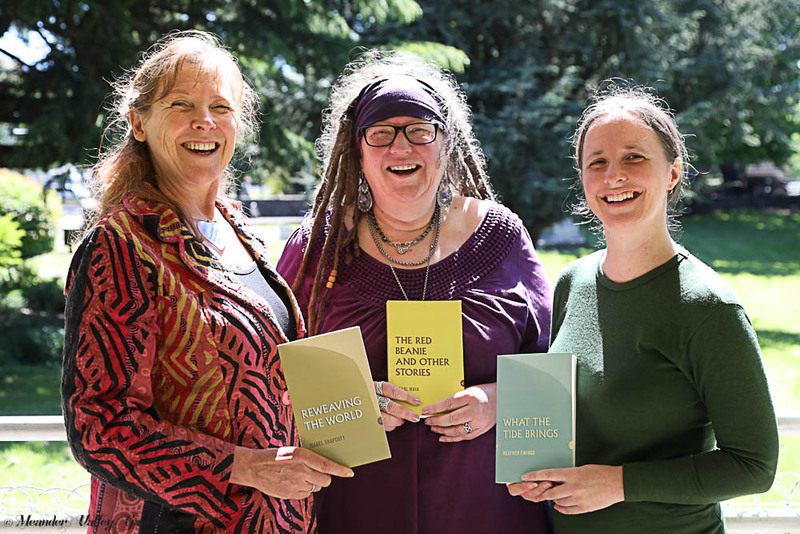 The launch was held in Hobart, and the Library project remained on display for a month that included public readings and discussions as well as being a space for the public to come and browse. “Being commercially published in Australia can be really challenging,” added Ms Shapcott, “and this was a great opportunity for people to contribute a book that didn’t have to fit into a commercial stereotype. Everyone has a story to tell and this was the chance to do just that.” There were over 180 projects offered to the People’s Library and the list was whittled down to 115, 15 more than the project organisers originally planned. Not available for sale, the entire collection of books will be available for loan through the Launceston and Hobart libraries. Fairy Helmets by Jade Hallam. FOR THOSE who have been enjoying the short walk photos in the Gazette each month by Jade Hallam, you may be interested to pop into Pixels Gallery during November to check out her equally inspiring series of macro images. Jade loves to photograph flowers, but fungi are her favourite. From May to August she is always on the lookout for an interesting specimen. World of Macro, Kooparoona Niara, is on show daily for the month of November at Pixels Gallery in the Deloraine Online Access Centre. A THOROUGHLY Tasmanian play written, performed and directed by three Tasmanian men, will come to Deloraine’s Little Theatre on the 15th November. 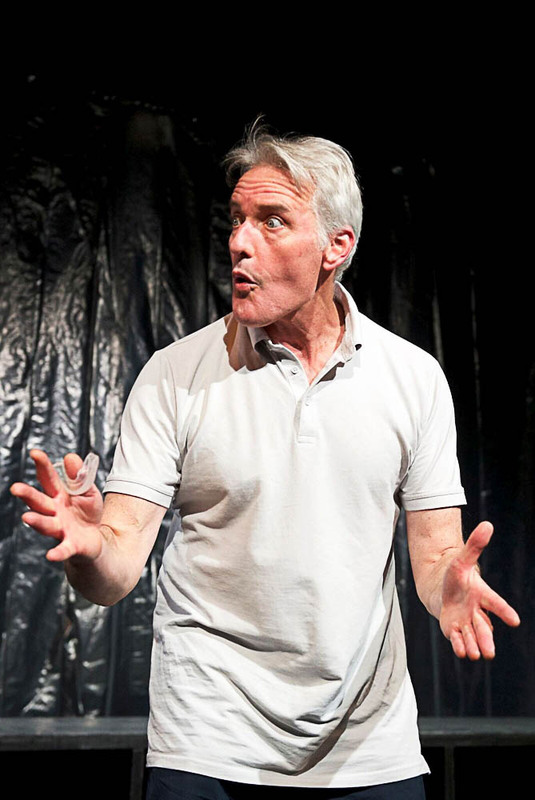 Twelve Times He Spoke is a one-man play written by award-winning Irishman Finegan Kruckemeyer, who moved to Hobart in 2004 and has had 86 commissioned plays performed on five continents and translated into six languages. His work has enjoyed seasons in 200 international festivals, including at the Sydney Opera House. The play’s only performer, Guy Hooper, moved to Hobart with his family in 2007 and has appeared in many productions there including plays for the Tasmanian Theatre Company and Blue Cow Theatre. Director Ben Winspear is the only one of the three born in Tasmania. Married to actor Marta Dusseldorp (Janet King, Jack Irish), the two have become a power couple of Australian theatre, performing together in TV’s A Place To Call Home and on stage in Scenes From A Marriage. Twelve Times He Spoke premiered at the Theatre Royal in June this year, telling a man’s story through 12 speeches. It begins simply enough, mapping the twists and turns of one man’s unremarkable life. But the course he has charted is not the one that unfolds and he ends up in places – some quite dark – that were never part of his plan. The play, commissioned by Guy Hooper, Blue Cow Theatre and Tasmania Performs, has been lauded. Hobart theatre director Robert Jarman said: “In just 75 minutes he conjures an entire life, encompassing some 50+ years of a man’s journey from boyhood to maturity. THE MOLE Creek Photographic and Visual Arts Group have donated the $200 proceeds from their 2018 calendar to the Trowunna Wildlife Sanctuary. Member of three years, Keith Cole, said the notfor-profit Group enjoy their hobby while raising funds for a worthwhile cause in the community. “We hope to make the donation to Trowunna a regular thing, as every little bit helps with animal conservation, “Keith said. The Photographic Group share a passion for learning and sharing, with a little bit of good-natured competiveness thrown in. They have regular outings in and around Mole Creek and ‘attend an ‘informal’ meeting once a month. New members are most welcome. Please visit them on Facebook for further information. Ellie Newland’s work entitled ‘Conﬂicted’ will be on show. TASMANIAN YOUNG Artist Award. 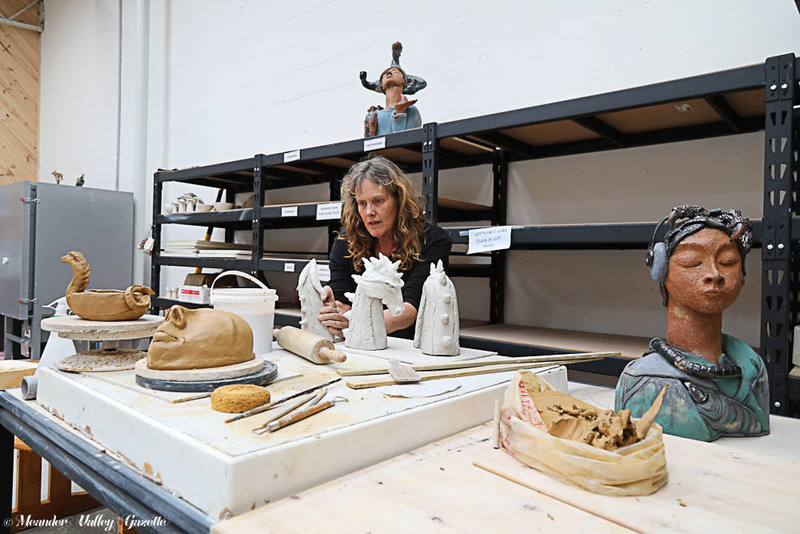 This State-wide award, ﬁnanced by Rotary, offers the chance for talented young Tasmanians to exhibit their artistic talent to a wide audience. Now in its 2nd year, the exhibition, to be shown at the Deloraine Creative Studios, will include works by 28 talented school children from years 7 to 12 which are their personal interpretations of this year’s theme of “Phases”. The exhibition will be shown from the 1st to 30th November. Drop in and be surprised!